During a recent radio interview, I heard someone bemoan all the reading of insignificant detritus he’s done on the Internet, while the good books on his To Read list gather dust: “It’s like I’m on the millionth page of the worst book ever – but I can’t stop reading it.” We’ve all wasted precious time; it’s not the worst sin in the world. But when you find yourself surfing the net and reading about what O.J. Simpson had for breakfast in his prison cell, or about a sighting of Kim Kardashian breast-feeding her baby in public – then you know that some better part of the world is passing you by. When you start to tally up all the time that gets away, the math is instructive. If you took twenty minutes each day to read good stuff (see below), you’d end up with 120 hours per year. Depending on reading speed and book size, that’s between six to twenty-five books a year. That’s time well spent – directly beneficial to you and indirectly beneficial to those whose paths you cross. Reading a book is akin to having a conversation with another human being: a deep, meaningful, thought-out exchange that as readers we are able to conduct on our own time. Perhaps a bit grandiose to say, but having a varied and wide reading list is akin to having a conversation with the world. This conversation makes us more aware of our place in the world, and (hopefully) better citizens of it. 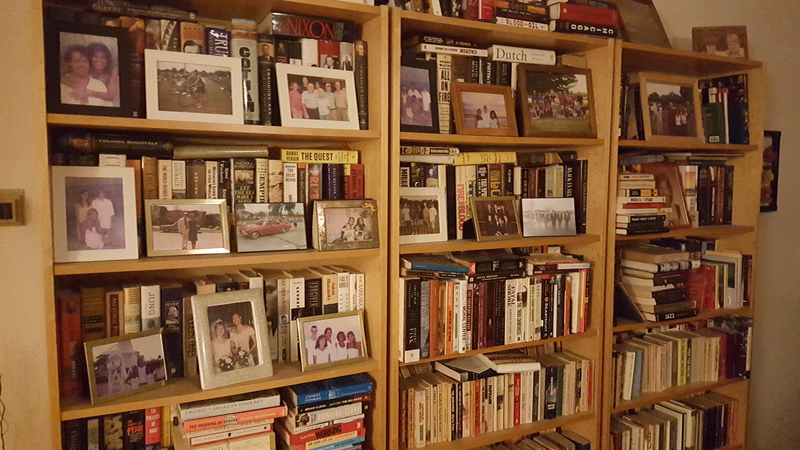 The home bookshelves – a blessed mess, yes. Good Stuff: While I do read fiction, I’m admittedly over-balanced on the non-fiction side. 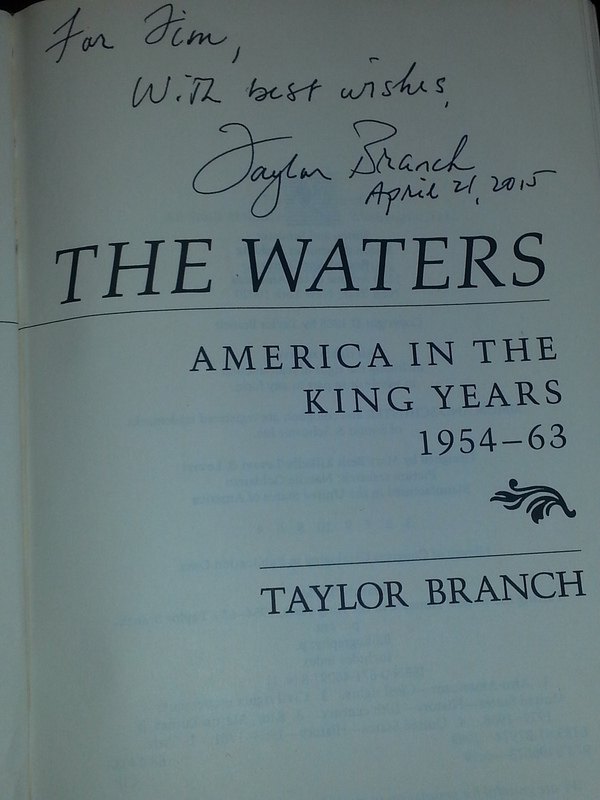 Taylor Branch’s Parting the Waters, Dee Brown’s Bury My Heart at Wounded Knee, Paul Johnson’s Modern Times, Richard Rhodes’s The Making of the Atomic Bomb, and Daniel Yergin’s The Prize are but a few of the captivating books I delved into over the years. There are many other books I would add to my A-list: Edmund Morris’s Dutch, Bill Bryson’s A Short History of Nearly Everything, and Jared Diamond’s Guns, Germs, and Steel are but a few others. While my three kids were in college, they received from their old man a hand-picked bundle of books from the good stuff list. Lucky them! I realized they weren’t going to read these books while in college – they had other books to read and happenings to attend. Yet, like a seed planted in good soil, I trust that this gesture someday will bear beneficial fruit. Occasionally, Facebook friends will call out for “Top 10” or “Best Ever” reading lists. As we all know, there’s a lot of good stuff out there. It’s eye-opening to see what others are reading; it enlarges the conversation. It’s a blessing to have time to read. There’s a great difference between information and knowledge. The Internet provides plenty of the former, whereas good books help engender the latter. I’ll continue to blog on the net, with the purpose of supporting common good development, pointing out the good books along the way that help us get there. Let me mention one more great book: Robert Sapolsky’s classic from 1994, Why Zebras Don’t Get Ulcers. Ahem! JaLBM Summary Version/Study Guide Now Available! Brad Highum, a pastor at Abiding Love Lutheran Church in Austin, has been a great supporter of Just a Little Bit More from its very inception. * Back in 2011, we lunched over gyro wraps at the Phoenicia Bakery on South Lamar in Austin. We sat on the picnic table outside in the hot fall wind (Phoenicia, abundantly stocked with Greek and Arab staples, doesn’t have indoor seating) and went back and forth about the 2007-08 economic swoon and the related topics of social immobility, rising inequality, and childhood poverty. Brad’s enthusiasm let me know that my thinking was on the right track. JaLBM came out in May 2014. My own congregation, St. John’s/San Juan, and Brad’s were the first congregations to participate in a book study of JaLBM. We conducted the studies concurrently with the purpose of compiling feedback and notes that would contribute toward a study guide for other faith communities. Checking in at 110,000 words and covering the aforementioned topics related to social inequality, JaLBM is not a light-hearted summer beach read. (My brother Mike, however, did read JaLBM in three days at a Bible camp on Minnesota’s Lake Carlos – he is the current JaLBM speed-reading champ). For those of you waiting for an easier to read version of JaLBM, wait no longer. 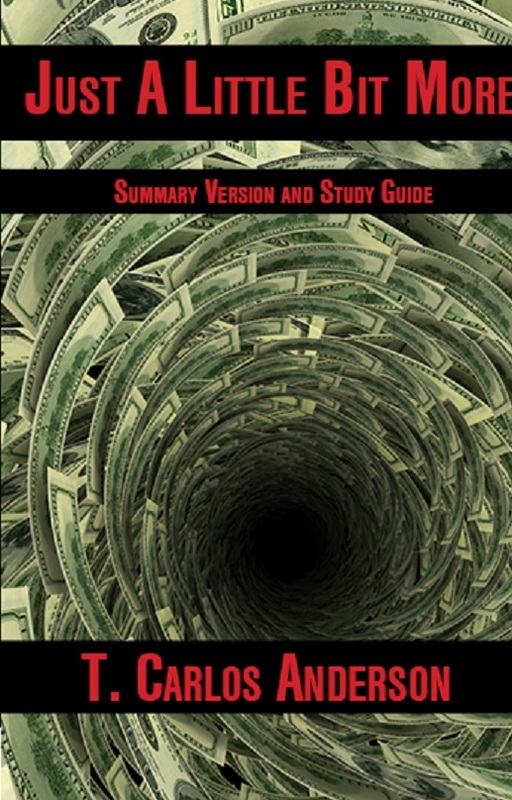 Just fifty pages and boasting a larger font, the 10,000 word JaLBM Summary Version and Study Guide condenses the full-length book into a Reader’s Digest version, with discussion questions at the end of each of the eight chapters. A study of JaLBM with others in a church, synagogue, temple, men’s group, women’s group, or book club setting affords rewarding discussion. JaLBM encourages interchange on the big topics related to social inequality without participants having to fall into well-worn political ruts. Readers of the full-length version and the summary version of JaLBM can be on the same page when it comes to discussion and analysis of the work, leading to activity on behalf of the common good. The summary version is also intended for high school and college student groups. It’s available now at the Blue Ocotillo Publishing website and soon on Amazon. Thanks to the good folks at Abiding Love and St. John’s for their work in helping to prepare the study guide questions. 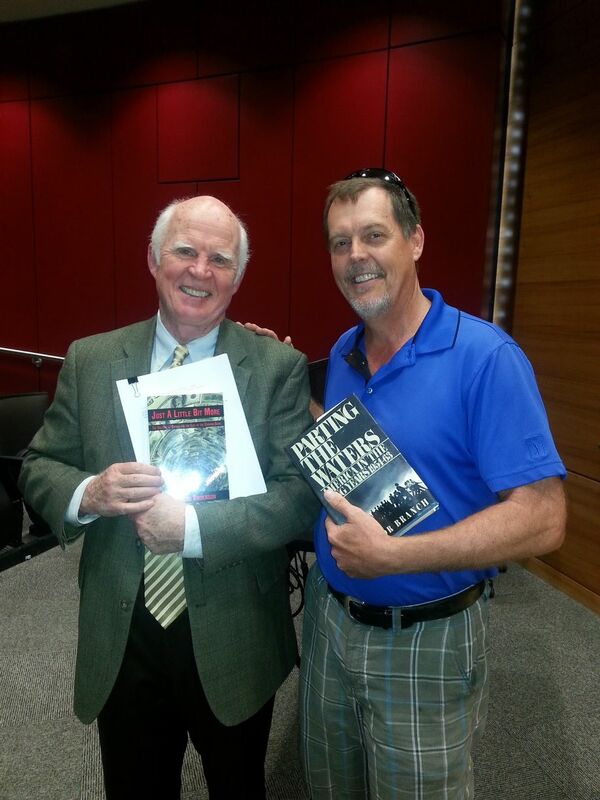 Greg Pierce, publisher at ACTA Publications in Chicago, advised me last summer to produce a summary version of JaLBM. ACTA produces community organizing and theology books, with a number of these in pamphlet or summary form. ACTA distributes JaLBM nationally. 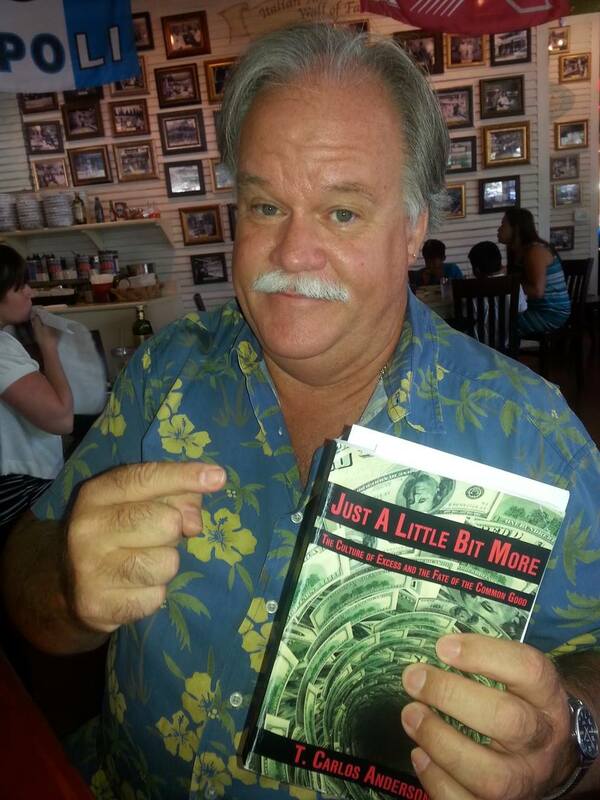 Greg has had over thirty years experience in the publishing field. 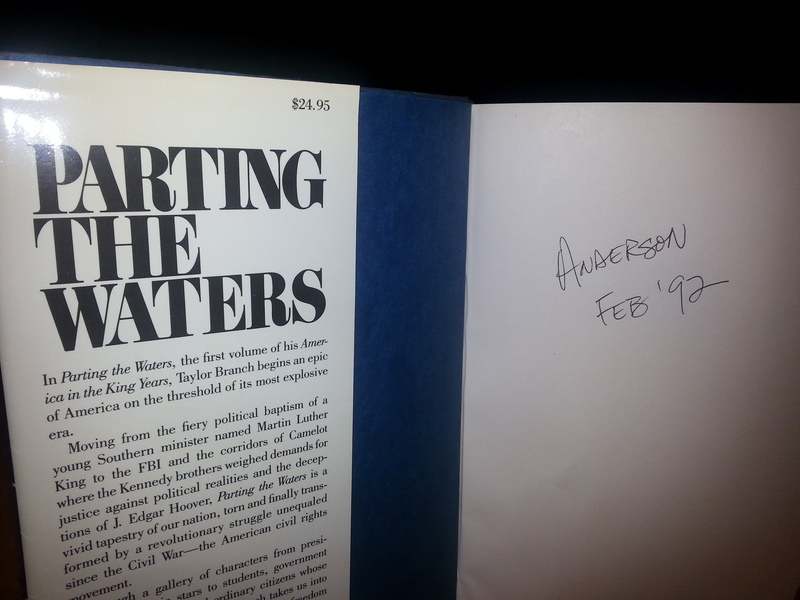 He told me that he has consistently seen priests and pastors – when visiting the book table at a convention or conference – overlook whole length books in favor of summary version pamphlets. Greg says it has something to do with their workload! No matter your work load, there’s a JaLBM version for you. I invite you to take a good look at it and enter into the ongoing discussion to combat social inequality and uplift the common good. Click here for Summary Version and Study Guide from the Blue Ocotillo Publishing website. *Brad’s colleague pastor at Abiding Love, Lynnae Sorensen, has been a steady supporter of JaLBM as well.